During peak season all of these companies are fully booked, so we’re looking into other companies to recommend! 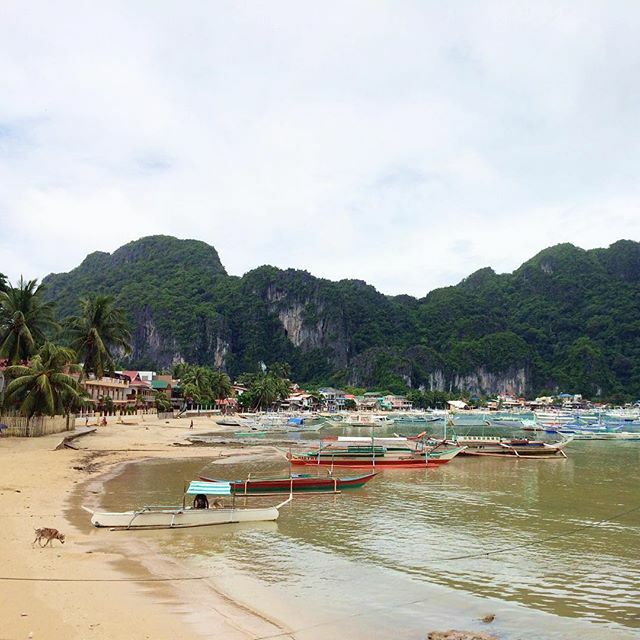 Enjoy a drink or meal in one of the many restaurants and bars in downtown El Nido. The beach comes to life in the evenings! Nacpan Beach is a 1 hour tricyle ride from downtown El Nido. Many of our guests choose to rent a motorcycle and drive out there themselves. 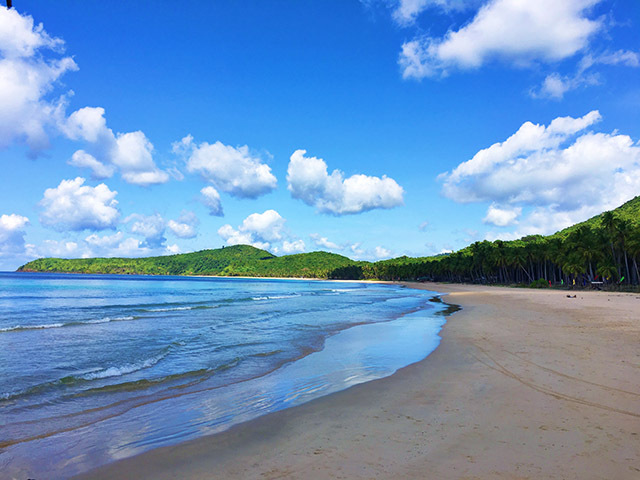 Nacpan Beach and its adjacent sister beach Calitang Beach offers long stretches of soft sand, and is definitely a must-see during your trip. The island in the distance visible from the shore is said to be owned by boxing champion Manny Pacquio. You will have to pay a 50 peso entrance fee to the barangay captain. This is one of our favorite beaches to spend the whole day and swim. These three destinations can be visited with an inland tour group in town, or on your own via motorbike. Makinit Hot Springs is not meant for swimming as the water is too hot. You walk over wooden planks, and it is not recommended for young children as they could fall in. Afterwards Nagkalit-kalit Waterfalls is a great way to cool off. It’s an easy 30-45 minute hike to the falls, and water shoes like Tevas are best because you will be crossing several rivers. Ile Cave is also nearby, and if you take a motorbike there, there will be about 40 minutes of gravelly road. Archaeologists have found human bones and pottery dating back 12,000 years here. Ile Cave is opening an archaeological museum nearby in March 2016. Duli Beach is about 25km north of El Nido, past Nacpan Beach, and a 40 minute ride by motorcycle. It’s not an easy drive, but often you’ll usually find the beautiful beach completely empty. The waves are big enough you can even surf here. There is a guy there that rents out surfboards and even teaches you how to surf! Dagmay Beach is another beautiful secluded beach past Duli Beach, about 28 km north of El Nido. It’s a 1 hour ride by motorcycle, with half the drive being a dirt road. It can be a challenging and hilly drive during the last 5km, particularly during the wet season. There are no places to eat here, so be sure to pack your own lunch. The walk from Dagmay (Verde Safari) Beach, past Mariposa Beach to the end of Duli Beach is about an hour. A 15 minute tricycle ride from downtown El Nido, just ask your driver to take you to Las Cabanas, which is a resort at the end of Marimegmeg Beach. It should cost about 150PHP. You can choose to hang out in one of the beachfront bars or swim in the water. 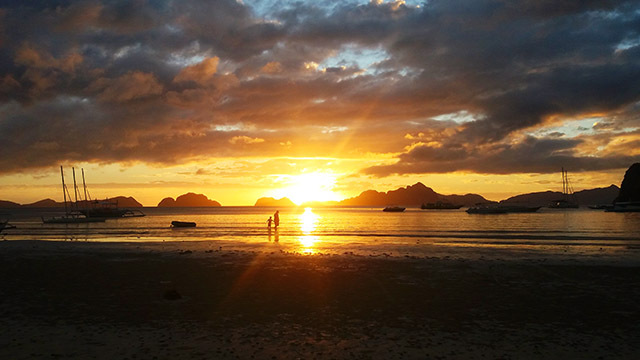 One thing is for sure — you will see one of the most spectacular sunsets of your life here! Ziplining is also available here. Just follow the signs and a guide will take you up for a small fee. 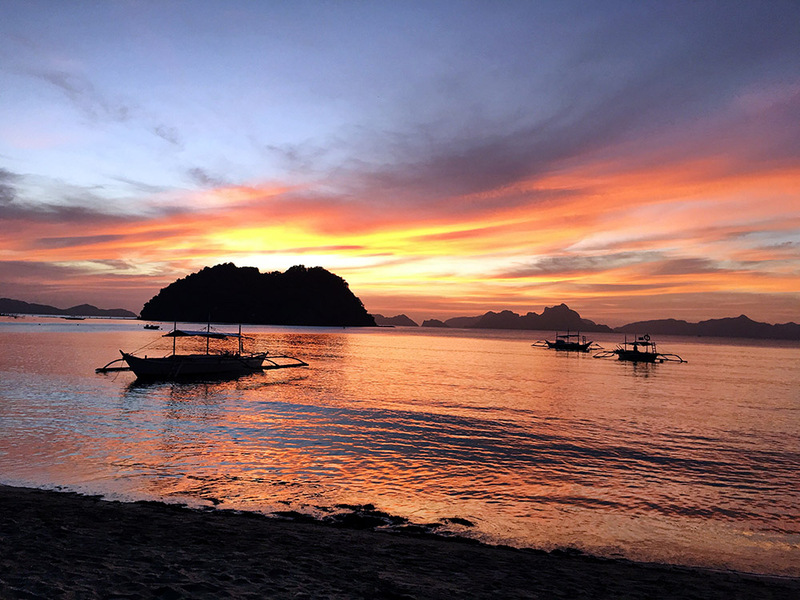 This sleepy beach 5-10 minutes from downtown El Nido is a great place to enjoy dinner and drinks, and enjoy a spectacular sunset. 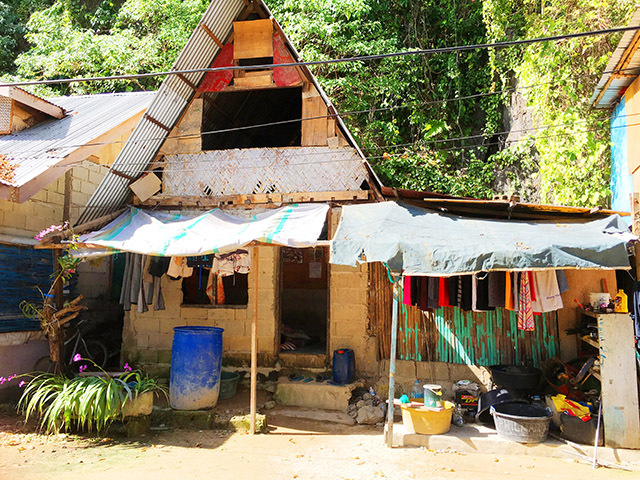 We offer a 3-hour guided tour of El Nido, the Capising fishing village and Corong Corong that will show you how the locals live, fish, build, eat and work. There are companies in town that offer freediving, paddleboarding, deep sea fishing, windsurfing, wakeboarding, sailing, cliff jumping, sunset dining, kayak, bike and motorcycle rentals. Something for every nature and adventure lover!